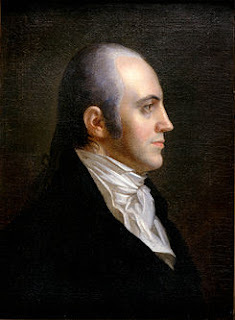 One of these days, I'm going to do a comprehensive Hidden New Jersey post on Aaron Burr. The guy keeps showing up in our travels, despite the fact that little to nothing has been made of his roots in the state. It's kind of sad, actually: Burr was born in Newark, educated at Princeton (his father was an early president of the College of New Jersey) and led troops in the Battle of Monmouth. Those are credentials that would seem to qualify him to be honored with a rest area on the Turnpike, but there's no recognition. Most people only associate him with the duel with Alexander Hamilton, which made Burr the only US vice president to kill someone in a civilian capacity. Burr was the reason for the visit Ivan and I made to the Hermitage in Ho-Ho-Kus. A Gothic Revival gem with a storied history, this National Historic Landmark was the site of Burr's first marriage, to Theodosia Bartow Prevost, 230 years ago today. It was the Revolutionary War and Theodosia's strong sense of self-preservation that brought the couple together. She was the wife of a British officer, Jacques Marcel Prevost, at a time when Continental troops were confiscating land with known ties to the Crown. While her husband was stationed far away and she had not seen him in some time, Theodosia knew that she had to do something to save her home and property from being seized. Building friendships with influential people on both sides of the conflict, she heard that General Washington and his troops would be traveling through Bergen County after the Battle of Monmouth in July 1778. It was customary for senior military officials to stay in the homes of prominent citizens, so Theodosia offered the Hermitage to Washington, along with the surrounding fields where troops could make camp. Washington's acceptance and subsequent stay marked the first of many visits by Revolutionary notables including Alexander Hamilton, James Madison, William Paterson and, of course, Aaron Burr. All may have played parts in helping Theodosia retain the property despite continued threats of confiscation. Burr's subsequent visits to the Hermitage set the foundation for a lengthy friendship with Theodosia, sustained by correspondence over several years. After leaving the military due to poor health, Burr returned to the law studies he'd begun before the war. Meanwhile, Jacques Marcel Prevost had been sent to Jamaica and eventually died from wounds sustained several months earlier. Her husband's death left Theodosia available for marriage, but it's said that she had some reservations about marrying her friend Aaron. At 35, she was ten years older than Burr, and he was in the early stages of establishing his law practice in Albany. To his advantage, he was an accomplished war veteran with many influential acquaintances and a fondness for smart women. Just six months after becoming a widow, Theodosia agreed to wed, and the happy pair tied the knot in a double ceremony with friends at the Hermitage. They settled first in Albany and then in New York City, leaving the Ho-Ho-Kus property in the care of her family. It seems that Burr likely spent no more time there after the marriage than he had before. Unfortunately, the marriage lasted only 12 years, ending with Theodosia's death from stomach cancer. Together they had one daughter, also named Theodosia, whom Burr made sure got a strong education in the Classics in a time when few women were so highly educated. The Burr story is just a footnote in the 250-year history of the Hermitage, and the house as it stands today looks very little like the structure where Theodosia lived. Georgian-style stone construction is now obscured by the Gothic detailing added in the mid 19th century. We'll be taking a look at that in a future Hidden New Jersey entry.